BREAM: The coverage of President George H.W. Bush’s legacy has been mostly positive, with some exceptions. We talked about those last night. But our next guest says the media never treated the president with this kind of civility when he was alive. 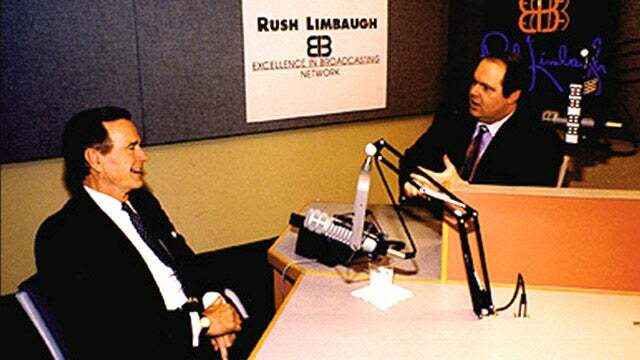 Here to explain, Rush Limbaugh, host of the Rush Limbaugh Show. Great to have you with us tonight. 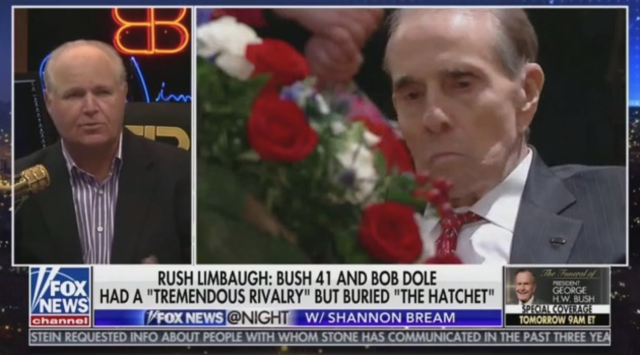 BREAM: Okay, so last night we talked about a couple of headlines, including one from the AP that had to be… well … reworked, shall we say, and some others that had an immediate negative reaction to the death of President Bush 41. And now in these coming days, we see a lot of fawning and talking about how he was so great at bipartisanship; he was a different kind of Republican. What’s that all about? 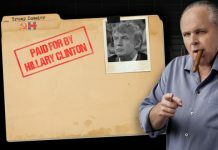 RUSH: Well, it’s phony. They never treated him this way when he was president. They were vicious to him like they are vicious and partisan to every Republican. I think it’s just a vehicle for them, Shannon, to be able to contrast what they think Trump is versus the way they’re telling us Bush was. The thing is that they never treated George W. Bush this way or George H.W. Bush — either one of them — this way. They had just as much animus for Bush 41 and Bush 43 as they do Trump for different reasons. 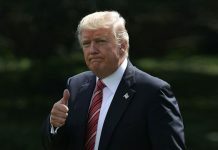 But since the current objective is to get rid of Donald Trump, however they can do it — driving down public opinion or Mueller’s report and impeachment — anything they can do to contrast Trump with what they say is the greatness and the way it ought to be. Every good Republican, in the media’s idea, loses. That’s why they celebrate Bush, because what did he do? He raised taxes. He was “bipartisan.” He went against the interests of his own party. That’s what made him a good guy. And it’s just it’s just phony. It’s nothing more than a vehicle for them to continually contrast this made-up image that they have of George H.W. Bush — which, by the way, what they’re saying about him now is true. All of the class and all the dignity all the sophistication. But they never reported on him this way when he was president. RUSH: Well, I had one of the greatest honors and thrills of my life. I was invited to spend the night in the White House during the campaign in 1992, the Lincoln Bedroom. The evening featured about an hour-and-a-half discussion of the campaign. At this point in time, Ross Perot was threatening him on the Republican side, with much the same kind of appeal that Donald Trump has and had in the 2016 campaign. And at this point in time, it was June of 1992, and there really wasn’t a considerable Democrat threat at the time. They weren’t thinking that Bill Clinton was really all that serious a contender. And I got the impression that they weren’t taking the campaign as seriously as they should have. But I remember the president telling me that he loved Tom Foley, thought we could really work with Tom Foley, and he had found him to be a very cooperative guy. George Mitchell, he said, was the most partisan man in Washington. But George H.W. Bush believed in the idea of service and government working together and compromising, and the end result was what was important to him. And as such, he didn’t fight back against any kind of the criticism, just like his son didn’t. 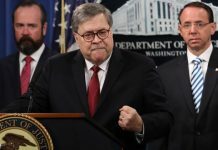 And I think those two facts — the fact that there was more attempted cooperation, no attempt to defend themselves against some of the most outrageous charges that they were faced with by the media and the Democrats — is one of the things that led to Donald Trump. Republican voters have just been frustrated that candidates they elect don’t fight back and win. Republican candidates don’t fight back — and when Republican candidates don’t fight, back, they’re also not defending Republican voters. 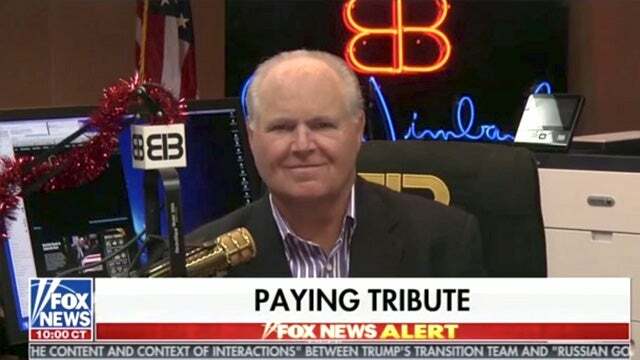 RUSH: So here comes Trump doing what Republican voters have wished Republican candidates would do for 25 or 30 years, and it’s really not a mystery why he won. 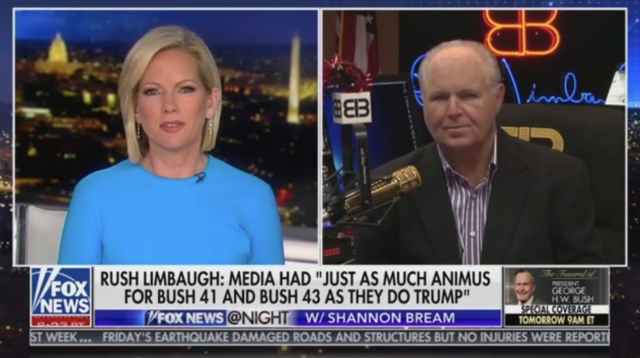 BREAM: Well, and to that point we’ve heard so much about the Bush family being very modest in saying, “It’s not all about you. Don’t go out there and be bragging about yourself,” to the point that Andrew Ferguson — who obviously was a speechwriter for Bush 41 during the ’92 campaign — lamented the fact that this guy was a World War II hero, but now that he was facing off against this young, upstart Southern governor, they didn’t want to be a factor. They didn’t want braggadocio to be a thing. But he talks about the fact that it was frustrating that he couldn’t write those things in his speeches until the very end. It wasn’t something that Bush 41 was going to talk about. Bill McGurn, in his piece in The Wall Street Journal, says this today. He says, “On the first day he was eligible, his 18th birthday, George Bush enlisted in the United States Navy. Even at that age, he could not abide the idea of another man standing in his place in the defense of his country, and this determination to serve would take him to some of the most horrific battles in the Pacific.” And yet, Rush, back in ’92 he wasn’t supposed to talk about that. RUSH: Well, Shannon, it was a different time. It was a different time. In ’92 it was a different time than ’42, but ’92 is closer to ’42 than ’92 is to today in terms of the definitions of public morality and values. And you nailed it. The one thing… I mean, I was raised this way. You do not brag. You do not brag about yourself. Even if you can do it, you don’t do it. It’s not becoming. It’s unseemly to do so. And the Bushes, if anything, were that. And you’re right. They had a belief that the office was bigger than the man. George W. Bush, I routinely asked him, “Why are you not fighting back against some of these just insidious personal insults?” He said, “Because I’m not going to sully the office and take it down to the gutter of where politics is today.” And I said, “But you’re letting down a lot of people that voted for you.” But that’s just the way they were raised — and not bragging and not talking about things that you had done. I think in those days, Shannon, it was thought that those great achievements and accomplishments would speak for you, that they would be part of how you were publicly known. But against the media onslaught to disparage that, to criticize it, to ignore it, the public had no chance. The public that was young enough not to remember World War II had no recollection of that George Bush whatsoever, and so they were never going to learn it because he wasn’t going to tout it. BREAM: Mmm-hmm. Well another man who is very much in that mold: Former senator Bob Dole, himself a hero and a veteran. A very special moment today when he stopped by to pay his respects to former President Bush 41, and they were great political rivals, as you’ve noted. It was a really special moment today. RUSH: Let me tell you, I saw that. I was just sitting down here after coming back from a commercial break and I watched it. I was glued to it, because you’re right. They had a tremendous rivalry and it wasn’t a widely known rivalry. It was political; it wasn’t personal. Bob Dole always felt slighted next to George H.W. Bush. Bob Dole was a war hero. Bob Dole lost the use of his arm. George Bush was shot out of the sky over the Pacific. He was made a gigantic hero. It went into making his career. Bob Dole was never afforded the same kind of thing. In his view, he never was. There were arguments over the Republican National Committee, arguments over whose turn it was to run for president, this kind of thing. And they were deeply, deeply felt. And Bob Dole today… This was just… It had me spellbound. The man cannot stand. He literally cannot walk. He is glued to his wheelchair. And he willed himself to stand up. He had an aide helping him, propping him up under his arms — and you could see the determination on his face. He was going to stand. He was going to defy the impossibility that he cannot do it. He defied impossibility and stood up for the barest of seconds and saluted with his left hand and then collapsed back to his wheelchair. And in that moment, said more about that generation — about respect, about honor, about integrity. That little piece. I hope everybody has a chance to see that, because Bob Dole was totally incapable of doing what he did today, and yet he did it. And these two people were able to bury the hatchet and come together toward the end of their lives. And I don’t… I wasn’t there, but I can rest assured that Bob Dole’s one commitment that he has had since George Bush died was to do what he did today and to make sure he did it. Because those are the kinds of things: Honoring people who you may have been at war with, good times as well. But they were in a lot of fights together for the same objective, fighting for the same cause. And they buried the hatchet. It was an amazing thing to see today. 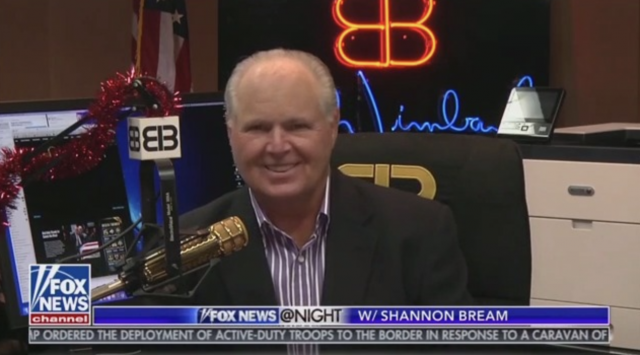 RUSH: You know, if I was Barack Obama, I’d be really upset, Shannon. All this talk about George Bush being the last days of civility? If I were Obama, I’d say, “What about me? You know, I was civil. I was a nice guy, sophisticated. I was the smartest guy in the room. Why are they going back and honoring this guy?” If I were Obama, I’d be worried. BREAM: Not so fast, I don’t think, Rush. Previous articleWhere Was This Love for George H.W. Bush When He Was President?